rickyb20: The Shadow Realm B wiki pages and backlinks have been hidden since the map wasn't meant to be released yet. Apologies for any inconveniences caused by this. If you have any questions or concerns, please feel free to PM me directly, thanks. rickyb20: The AQW Wiki Rules have been updated. If you are an active editor/poster on this wiki, new or old, please re-read them. Thanks! rickyb20: Guys, a friendly reminder to please not record critical hits (the big numbers that appear on your screen in orange) when recording monster damage. I've noticed over the past few releases that people have been doing this when they add in information. I encourage everyone who wishes to record monster pages to please read over the guide on how to properly calculate monster damage (that guide can be found by clicking here). If you have done a monster page over the past few weeks and recorded critical hits by accident, I ask that you please go back and fix your mistake(s). Thank you. rickyb20: I did a minor overhaul to the AQW Wiki Editing Guide in order to try and make things easier to understand. I encourage everyone to look through it. Thanks! rickyb20: Hi there everyone. Already posted this on Twitter but I'll post here as well. If you see somebody spam-making pages on this wiki (or the AQ3D wiki), PLEASE notify me immediately, either on here or Twitter; that way the problem can be dealt with quickly. Do not try to edit any of these spam pages yourself (you'd be wasting your time since I'll notice them eventually and can just delete them), and please do NOT communicate with these spammers. I will deal with them myself. Thank you. The wiki team wishes everyone Happy Holidays and a Happy New Year! Apus: Hi everyone! This is a reminder that all items with a year on the title that is seasonal rare rarity or seasonal item rarity should not have a year on its page unless it does not return. Thanks. Apus: The Adding/Removing Thanks rules and the Image Submission Guidelines have been recently updated with a few changes. Please take a moment to read through it once again. Thanks! The AQW Wiki Team wishes everyone a Happy Halloween! Stay safe and have fun! rickyb20: Missed a release? Our Chronicle of Releases has everything you need to know about AQW's past releases. Feel free to take a look through it! The AQW Wiki Team wishes all of our American players and staff a Happy Independence Day! The AQW Wiki Team wishes all of our Canadian players and staff a Happy Canada Day! Sato(xK): Thanks to Amduscia, the icons for the other 7 weapons has been released. We will now be replacing the Weapons icon on all shop pages with their respective categories. See Shop Template page for more information. The AQW Wiki Team wishes everyone a Happy Easter! rickyb20: Today is the wiki's 6th anniversary! Hooray! All the details on what's going to happen during our anniversary can be found here. rickyb20: You guys might have noticed some footers at the bottom of our pages. PLEASE DO NOT REMOVE THEM, since they are what the maintenance was for. Thank you. rickyb20: Wiki lockdown is over, for now. Next one will be announced in the weeks to come. rickyb20: The wiki is now officially in lockdown for maintenance, and will be unlocked on February 24th at 11:59 PM EST. rickyb20: Hello everyone. The wiki is going to be undergoing maintenance in a few days. Details are here. Thanks! Apus: Hey everyone! It looks like that a lot of people are confused about what the base damage of a weapon really is. The base damage of a weapon is defined as the damage of a level 1 weapon at 15 DPS calculated using a class with 100% weapon damage. Please review the Weapon Damage Thread Guide. Thanks everyone! Apus: Just a reminder to everyone. Please DO NOT make pages that are in the 7th Upholder Merge shop as the 7th upholder badge has not been released yet and therefore the item isn't available to players. Thank you! ShadowAQW: Hi everyone! We're having a small formatting issue caused by a change in wikidot coding that has just popped up today. Please keep this in mind as you use the wiki. We are working on having a fix up as soon as possible! Thanks for your patience. Apus: Hey everyone! Just a reminder that when you guys exit a page, DO NOT close the page by itself. Instead, please cancel your lock first before closing. Thanks guys! The wiki wishes everyone a Happy Valentine's Day! rickyb20: Imageshack is now banned from the wiki. When adding images to the wiki, please do not use it as an image-hosting site. Thanks! rickyb20: Adding / Removing Thanks ruling update, please read here. Thanks! rickyb20: I've taken the liberty of creating a new thread explaining the Wiki Mod and Admin positions. You can read it here. I've also taken the liberty of updating the Problem Procedures thread to include what to do if you have a problem with me, the Head of the AQW Wiki. Link here. rickyb20: Guys, please tag and parent your stuff. I'm getting sick of having to tell people (including some who have even been here for months) to do so. If you don't know how to parent or tag, then read my tutorial. Thank you. rickyb20: Please do not use the name "Drakath" while on our IRC channel. Since he is an alt AE staff account owned by an AE staff member, and since he has his own twitter, we are considering his name an official AE staff name. Anybody using the username will be warned to change their name, or suffer the consquences otherwise (which will be either a kick or ban depending on the severity of the offense and the staffs' decision). Staff impersonation is something that we (and the staff at AE) take very seriously, so please don't do it. Thank you. Apus: Hey guys! I've been noticing people coming into the Wiki lately but haven't been reading the rules and the guides. I can't stress this enough: PLEASE, take a look at the the AQW Wiki Rules, editing guide, Image Submission Guidelines, and the adding/removing thanks rules before you guys start editing so that you guys would understand how to edit the wiki better. If there are any questions regarding the rules and the editing guide, please PM a member of the wiki team. Apus: Lately a lot of people have been asking me and other staff on how to become a LoreKeeper. For those of you who want to know, PLEASE, read this thread if you are interested. Thanks guys! rickyb20: Regarding Blade's b-day items, if you do find an item and choose to make its wiki page, please leave the location off of it. We are doing this at the request of the AQW Staff, since this is an item hunt. Thanks! rickyb20: Regarding Memet's b-day items, if you do find an item and choose to make its wiki page, please leave the location off of it. We are doing this at the request of the AQW Staff, since this is an item hunt. Thanks! Edit: I forgot to mention, please do not post the location in the Wiki Forums. Anybody who does so will have their post deleted. Repeated offenders will be warned. Thanks! rickyb20: Please leave any rare tags on Quibble's stuff. It's going to only be staying for a few hours, so I don't want you guys wasting your time by removing them. Tweet is here. Edit: PLEASE do not add rare tags to any of the shops other than the ones Alina has listed on Twitter. They are going to be coming back. Thanks! Apus: Happy Holidays! I've seen a few people today add in 14 tabs to items in the Frostval Seasonal Shop today even though the shop was not there. PLEASE double check before you post. Thanks. rickyb20: Guys, PLEASE check your sources when fixing typos. There was a typo in the BrightFall commander shop that existed in-game ("commadner") that people had been attempting to fix because they assumed it was incorrect. Please remember that we record all typos that appear in-game. Thank you. ShadowAQW: The Harvest season banner is now up. Enjoy! The wiki team wishes everyone a Happy Halloween! We at the wiki would like to wish Alina a very Happy Birthday! Hope you have a great day! ShadowAQW: To help give the wiki some visual flair and help spread the holiday cheer, I'm planning on making seasonal event versions of the the AQW Wiki's main banner. The first seasonal banner is Mogloween and is now live! Sato(xK): Please see this post by one of our fellow LoreKeeper's Shalmaneser regarding index pages. rickyb20: Ok, people do not seem to get this, so I'm going to explain it briefly. Items in the Cyber Monday Shop (and other shops that use this method) that have a small rare image tag next to them are items that went rare before the actual shop did itself. Items that don't have a small rare image tag next to them are items that went rare along with the shop. Please stop adding these image tags onto items that don't have them. I have already had to PM several people about this, and I do not want to have to PM anybody else. Thank you. rickyb20: Please do not add any rare tags to the LQS items until the last re-stock date has passed. A list of LQS re-stock dates and times can be found here. Thanks! Sato(xK): Confused or unsure on how notes work? Check out the Note Consistency thread for more information on note usages, formats, and more. rickyb20: The Weapon Damage thread has now been updated. The latest version can be found here. rickyb20: I'm going to be absent from July 28th to Aug. 1st. Tendou is going to be the temporary Head of Lorekeepers during this time. Please contact him or Ash if you're having any issues with the other Lorekeepers, or if you have any questions. Thanks! rickyb20: I encourage all staff members to please read this post. rickyb20: Just so everyone knows, the wiki page for the monsters in Creek Attack is called "Hero". rickyb20: Regarding the "???" item: Its wiki page can be found here. Please do not make anymore duplicate pages of this item. Thanks! 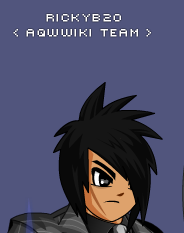 ShadowAQW: It's the AQW Wiki's birthday! We have now been running for a whole 5 years! Congratulations on such an important milestone! The wiki would like to give thanks to its staff members, both past and present, as well as every editor! We couldn't have done it without every single one of you. Keep up the great work, and here's to another 5 successful years! Wiki on! Zyrain: We have renamed our official Helpers to the new title of LoreKeepers! Ashendal: It's always been the stance of the Wiki that anything that is not allowed, accepted, or otherwise given the ok to do by A.E. is not allowed on here or to be used by members of this site. Saying that, Private Server's and anything of that nature should not be used. Anyone that is found to be using a private server will be removed. If there's an issue feel free to PM me about it. Otherwise, if it's not allowed by A.E. don't do it. rickyb20: Guys, please remember that we record ALL information how it exactly is in-game. This includes typos. Thanks! ShadowAQW: A reminder to you all. As per the AQW Wiki Rules: Do not force lock other users. Please be patient and wait until the user has finished editing. If you need this explained in greater detail, contact myself or another staff member. Thanks. rickyb20: Please read this post regarding the new helpers hired and changes to the hiring process. Thanks! ShadowAQW: I've had to say this too many times over the past few days, so just a general reminder to everyone: Do not remove old information. Please use the strikethrough feature instead when updating pages. Thank you! Zyrain: Just another reminder that the Wiki is not a competition. Recently I have noticed users locking several pages at once. Please refrain from doing this, the Wiki is not a race. There's no need to lock multiple pages just so that you can create them, because not only is this unfair but it will also take longer to get information on the Wiki. Just create one page at a time. rickyb20 I updated my helper thread with a FAQ (Frequently Asked Questions) section. Feel free to give me any feedback/suggestions for questions you want me to add. rickyb20 Guys, please don't take images of helms with the Invisible Ninja armors, as we need to know where on the head the helm and face are positioned. Thanks! Hina: Few changes to the wiki. Non-paying players will be referred to as "Free Players" on the wiki, and will be reflected in the tag names (i.e. freeplayerpet). We will also be phasing out the "membersmall.png" and "memberlarge.png" files, and using the new "legendsmall.png" and "legendlarge.png" filesnames. The wiki team wishes to everyone a Merry Christmas and a Happy New Year! Happy Holidays! The wiki team wishes everyone a very Happy Halloween! rickyb20: Guys, for the newer Wheel of Doom items, please don't put "Reward from Swaggy's Quests" anymore. Yes, I know it redirects, but the only reason the redirect was added was the avoid changing all of the links in a mass edit (for now). From now on, please add "Reward from the Wheel of Doom", so that we can avoid confusion (since the quests don't actually exist anymore). Thanks. ShadowWhisperer: Attention all! The Quest Template has been updated; I have posted in the forums to let you all know that we are fixing all the templates! Thanks for all your help fixing these quest pages. :) Wiki ON! rickyb20: UPDATE: We're not considering the Chaos War an actual war anymore. Please read here for more info. Thanks! rickyb20: Guys, in order to view the new image tags, please, please, please clear your cache. There are tutorials on how to clear your cache here. Thanks. Zyrain: This is a massive announcement which needs everyone's attention! Regarding the change from "Members" to "Legends" in-game, please read this thread! rickyb20: Wiki Helper Application thread has been updated. rickyb20: I have updated the need-image tag guidelines. The new guidelines that I'm going to add to the ISG can be found here. I will be adding them to the ISG soon. Hina: Reminder to everyone. Please, please, PLEASE double check your edits. Make sure things are exactly what they are in-game. Do not make up your own shop names, do not correct existing in-game typos, and do not press "Save" when editing until you're absolutely sure that everything you just did is correct! It only takes a moment to skim through your changes every time you edit and saves us the same amount of time from having to correct each one. Accuracy is a rule (#10). If you plan to edit, do it right the first time. If you're not sure of something, ask. I don't like ranting anymore than you like reading this, so please just take a few seconds to go over what you just did before committing your edits. Haileym1 - Angelita: Note! : Here a link with some suggestions that are ONLY for female armors. rickyb20: Guys, we don't add NPC image changes for Battleon. We only record environmental changes for that page, so please stop adding these kinds of images. Thanks. Hina: Changes to the wiki: For the New Releases page, we'll start splitting weapons into their individual types, and adding titles to each section rather than splitting with a "-". Hopefully this will make updating indexes easier. We'll also be tagging animated items along with adding an image of the animation, if we haven't done so already. This includes weapons, armors, certain capes/back items, and helms. Pets are always animated, so we won't add those (MAYBE battle pets, but we'll see). Aside from that, there will be changes to some rules/guidelines, so keep an eye out for those (blue text = new info). Zyrain: The AQW Wiki Rules have been updated with the addition of No force lock removals. Forcibly removing a user's lock on a page is a ban-able offence. If a user has locked the page it means that they are in the process of editing the page. Forcibly removing that lock will delete that user's work. Please be patient and wait until the user has finished editing. Please PM a Wiki Moderator or Admin if your lock has been forcibly removed. Hina: Please do not replace existing images with a White Map image. White Map is an ideal place, but NOT a necessity. Replace images only if the existing ones do not follow the Image Submission Guidelines. Hina: New banner by ShadowAQW is up! Enjoy! Zyrain: Want to help both the AQW Wiki and AQW players? Help record the releases of AQWorlds in the Chronicle of Releases page. This is a community project which needs you. For more information, refer to this thread. Please only consider taking on this project if you can truly commit to the role. Thanks! ShadowWhisperer: In addition, we have now opened up an application thread, and also updated the application a bit. Please check out the Chronicle of Releases Application thread. Thanks! rickyb20: For those of you who are changing (or are going the change) the names of the upgraded starter classes (Sorcerer, Warlord, Acolyte, Renegade), we are not changing the names of the pages at this time, due to the name not showing properly in-game. Please do not re-name/create anything that has to do with the classes changing names until the name has fully be fixed. Thank you. rickyb20: Guys, it's "I", not "L", and this tweet practically confirms it. Please stop making "GL J6" pages. Thank you. ShadowWhisperer: To add onto rickyb20's post, please stop creating different versions of the "GI J6 Shop", the page is here: GI J6 (Shop). Thanks. rickyb20: Before the new release begins tonight, I'd just like to say a couple things. For those of you who don't know, Alina has kindly given us access to a previously mod-only area called White Map. This area will now make it easier to take pictures. I encourage everyone to please try and take any pictures there from now on. 1. Guild Names. Please try and keep out your guild name as best as you can. We don't want pictures like this. If you're trying to take a helm pic, but can't get the name out, use the /rest emote. 2. Morphs. If you are taking a picture of any armor that changes the face or head (such as Dark Fiend Morph), please take it with a bald head. Hair can block out details and other parts of the armor (for example: Dark Fiend Morph with hair). Thanks for reading, and Battle On! Haileym1 - Angelita: In addition to suggestions, we are also in need of experienced artists who can use advanced programs for editing images (Example: PhotoShop). If you want to help us with this great innovation, please let us know in the Wiki Forums or send us a PM to any of the moderators. Thanks! Zyrain: If you're interested in helping out the HEROSmash! Wiki, the Helper Applications have opened! If you're interested in helping out the OverSoul Wiki, the Helper Applications have opened! Also, an IRC channel has just been created for the OverSoul Wiki so be sure to check out #OSWiki! Head Moderators — Each section of the Wiki has a Head Moderator. They're in charge of their specified section(s) and are the ones to contact if there are any questions about their section. It is their job to make sure that these sections are maintained and edited correctly by other users. If a new suggestion arises involving their section, they will have the final say on the matter (unless heavily outvoted by other Moderators and Admins). Head of Helpers — They are similar to a Head Moderator, except that instead of a section of the Wiki to moderate, this user will be moderating the Helpers. This Moderator will be in-charge of accepting Helpers from applicants, and discussing with them which sections they will be assigned to, after discussing the applicants with fellow Moderators and Admins. The Moderator will monitor their progress as Helpers and help train and guide them, suggesting them to become Moderators to the Admins if they feel it is appropriate. If a user, Helper or Moderator has an issue with a Helper, the Head of Helpers should be consulted. The current Head of Helpers is rickyb20. Congratulations! rickyb20: We're in the process of testing a new translator on the site! Feel free to try it out, and tell us what you think. If we get enough positive feedback, then we'll add it to the sidebar. rickyb20: We are currently in the process of adding a new tag to the wiki called the "Seasonal" tag. This tag will replace the rare tags on seasonal items that will be returning next year. Please added the rarelarge.png image tags on the seasonal tags just below the year tabs. An example of what I'm explaining would be like this. Thanks everyone. ShadowWhisperer: Thanks for all your help guys and gals on keeping our wiki constantly updated! Battle and Wiki On! Hina: A little late but Happy New Year everyone! To start off our brand new year, I got great news for wiki helpers! Alina has decided to give us a "wiki reward" for our wiki helpers for being totally awesome and contributing to our ever growing wiki. This includes all wiki helpers/mods/admins, past, present, and future. The reward in question has yet to be decided, so this is where you all come in. We'll need help deciding what the reward is, so if you have a suggestion, post about it here! Special thanks to Flitterifie for the image! ShadowWhisperer: Guys, sometimes we have people create accounts on the wiki just to spam and mess-up our pages. When this happens, just revert the page back to its correct version, and carry on with your edits. If the spamming continues to happen on the same page, don't hesitate to post in the correct Forum Category or PM any of the Moderators to lock the page. Thank-you for all the work you guys are putting into the AQW Wiki to make it the best it can be. Continue doing what you guys are doing. Battle and Wiki On! rickyb20: Guys, please do not make any wiki pages for the Nulgath Runes, as they are all temporary items (which means they appear in your temporary inventory and dissappear when you log out). We do not record temporary items on this wiki. Should they become misc. items (meaning that they are items that stay permanently in your regular inventory), THEN you can make wiki pages for them. Thanks everyone! rickyb20: We are currently making a new format for the Book of Lore page, and we are missing a TON of badges. If you would like to add any, please post here. Thanks! WorldMage: Not sure what to do? Read the following! Some important reminders that starters need to know! AQWWiki Rules - This is the page where all the rules you need to follow are. Follow these rules carefully and do not break any of them, breaking a rule from the 10 most important rules is not taken so kindly. AQWWiki Editing Guide - This page will show you what you need to know when you are editing a page. It'll be helpful, so please read it carefully. Image Submission Guidelines - Yes, there is also rules for submitting an image on the wiki pages, read it and find out the rules! Read carefully! Wiki How to / Q&A - This page will show you some important questions asked by users. These questions are important. Please take a look at them. Adding/Removing Thanks - This page will show you the rules when adding your thanks to a page that you have worked in. Read it carefully due adding/removing thanks without following the rules might come out with warnings or even bans!! And none of us Moderators/Admins like to give warnings or bans. Problem Procedures - This page show you answers for common asked questions or problems. Basically, this will show what to do when you have a problem. Those are the main rules, please follow them carefully. Not following the rules may result in warnings or even bans. 1- The most important thing is accuracy. Please, please, please, be accurate in your edits. Do not spam the page, carefully add stuff, don't add stuff to the page that do not exist, take a look at your edits after your done. And use the Preview button (found below when editing a page or posting on forums) to see what you have done before saving the edit. 2- Use .PNG file type for images, because it results image in good quality. Poor quality isn't good, people can change the poor quality image freely. 3- When adding a tag, make sure that the tag really exist in the wiki (Click here for the list of existing tags on the wiki) or if it doesn't exist and you feel that it's important and needs to exist then freely suggest it here. 4- When parenting a page, just like the tags, make sure that the parent page belongs to the page. 5- Do not the spam the page, as I said, use the preview button, do not spam! We hate spam. About 10 years ago, a company dedicated to the entertainment industry named Artix Entertainment was founded by Artix Krieger. They originally started with a game called AdventureQuest, they proceeded on with DragonFable, and soon after AdventureQuest Worlds (which served for 4 years, bringing fun in each release), and then with the other games that were created each year thereafter. And now, all the wiki team wants to give them a well-deserved tribute for this 10th anniversary, since 10 years of dedicated work in designing and writing each story of all the games that we enjoy is such a milestone. Also we want to pay a tribute to those who made all this possible; they give the best of themselves to make each release the best it can be. Game Masters: Galanoth, Geopetal, Warlic, Cysero, Titan and Korin. Game Designers/Writers: Alina, Beleen, Dumoose and others who design and write releases. Artists/Animators: Oishii, Mido, J6, Nulgath, Dage the Evil, Samba, Nightwraith, Charfade, Ghost, Tomix, Thyton, Yergen, Jemini, Randor the Red and and others who provided us with their talent to draw / animate items or monsters in all games. Testers: Reens (our AQWwiki Founder who created this awesome wiki), Stratos and Maegwyn. Now I can only thank you for giving the best, for letting us have fun with each release and giving all the support we have received thus far. Thanks for everything and continue going through the years! Battleon ON! AQWorlds Wiki at the service of Artix Entertainment! - Special thanks to Kaibinlore, the artist who made this amazing image and for helping us in this announcement, without him we would not have been able to make this. Haileym1 - Angelita: Guys! I wanted to announce that last week during the PTR test we created the official guild wiki (not had we planned to do until the end of the test) but we did it since an unknown player grabbed the name that we were going to use that was 'AQWWiki Staff' suggested by Jenchy. Now we have changed the name, is called 'AQWWiki Team', this name I was it arguing with Jenchy and Flitterifie, then us we were agreed with that name. This guild is official, confirmed by the AE staff and our administrators (Hina and mturf) if they see a guild with a name similar to our, means it is a imitation. Note: The guild only will be conformed for helpers/mods/admins of AQWorlds wiki, NOT for normal members. If you are part of the wiki team and have not yet been added to the guild, please send me a PM. Thanks! WorldMage: The site I used to upload images from has crashed two times before so several images had crashed as well so I'm guessing that it might crash again. If you see, by any chance, that the image is uploaded from the site named (Up.Arab-x.com) then freely change the image itself into another uploading site. Tendou no Mazo: Please, please, please be accurate when editing any page as stated on Hina's pinned reminder (clearer reason why we have pinned up her reminder). Accuracy never, again, never meant only adding true prices, updating the page due new content or even vanishing some rule breaking content on that page it also means keeping the page clean, yes, the whole content of that page. Do not discuss on pages, do not re-add edits to spam them (we do not need discussion on our pages due we have a FORUMS on our wiki), if you do not feel so good to add some issues on our forums you can freely PM any of our wiki mods located on this page to solve your issue, even if it takes few days to be solved spam never was and never will be welcome on any kind of rules in any forums (non-forum websites are included as well). Our AQWWiki How To and the 10 Fingers of our Wiki are there to help you out to vanish future issues, even if you already applied all rules and the page was spammed more than 4 edits do not hesitate to PM a wiki mod or our 10 Wiki's Fingers may rip out some edits permanently (sadly, if you do not read our rules you will never understand why we're hunting soo much :P). Be sure to follow these conditions first if you're supposed to create any page. WorldMage: Please, stop adding the need-image tag unless the image is under these conditions. rickyb20: Over the past couple of months (along with the PTR re-released and the accidental release of the "Guild List" button), I've been seeing people creating pages for their own clans/guilds. Clans/guilds are NOT meant to be posted here. EVER. We have other places dedicated to this kind of stuff, such as the AQWorlds Unofficial Guilds section of the AE Forums. This is actually a rule (#9), and rule-breaking isn't taken very kindly. So please, stop posting clans/guilds here, and post them in their appropriate places. Thanks. Hina: The HeroSmash wiki is in need of people to help out with page creation. If anyone is interested, please hop on over there and lend a hand! Jenchy: Adding to World's announcement. I have been getting messages from people the the Artix Entertainment Forums for AQWorlds saying that they dislike the preview picture screenshots we use for the pages. They told be verbatim "If I wanted to see the preview of a picture I would just go in-game.". The only time we should use the preview picture if it's a Merged item or AC item. I want to make that a light rule for us to follow, thanks. WorldMage: Please, when adding a picture, please use the PNG File Type, it results the picture in good quality and it prevents troubles. Thanks. rickyb20: Please do not change anything with the Sanguine and Sanguine (Sword) pages. Please leave them as they are. Thank you. Jenchy: I didn't want to have to make an announcement after Hailey's announcement yesterday but as I see it, I have to make it. Guys, the Wiki isn't a race, make sure the page you make is correct to the item. If it says Xan's, make it Xan's, not Xans or etc. Now, if you want a page deleted or re-named, I am making it so you have to either PM me (any other Mod) or post it on the Wiki forums, because we have too many guys reverting pages back and forth as well as renaming pages to delete, making it extremely confusing and hard to pint point the correct page to fix/correctly rename. I myself or the other Mods cannot and really do not want to start handing out warnings, but as I see it, you guys are not playing nice. Please, this Wiki is to help, not over-complicate things for the people using it/trying to help. Haileym1 - Angelita: I was watching the work of new helpers and they surprised me, they're doing very well guys! However some of yours still needing to review the AQW Wiki Rules, please read to keep you updated, including our Adding / Removing Thanks Rules, there also some separated "how to" (like Weapon Damage Chart) you must read, if you are new, do not post anything without reading due accuracy is a rule. If you have doubts, questions or suggestions, feel free to post them in the Wiki Forums that is open to all users. I started doing a image backup for wiki months ago to prevent some pics to remains broked there (and to do a backup you need upload that image again, so it may broke on a unknown future). This Wiki Backup Tool am working (stated on AQWWiki Editing Guide) stores some of pics am working for and it still in progress, currently i only have Armors/Capes/Axes/Daggers done. Thats means if you have found a broked armor image, go to Armors section and recover the pic, simply adding new pics is a bit annoying and boring (also some perma rare items cannot be replaced easier) and using the link stored on backups you just need reupload them again. If you have a decent image better than those ones on backup list, you can freely add your image there and, if you wish your image on backup list go to the thread who fits that stuff and request a backup of that image then ill replace the old one. Over the past couple of weeks, I have noticed that A LOT of people can't seem to grasp what [[include image-tags]] actually is and what it does. So I decided to quote that section about it from the Q&A. I will say this only once. PLEASE do not add large image tags by themselves unless otherwise. Use the [[include image-tags]] system. It'll make it easier for everybody else. Thank you. Tendou no Mazo: When creating pages be sure to include the informations players want to see when accessing the wiki: Location; price and sellback; image (if applicable); additional notes like "used to get" or "used to merge". If you can't provide the page with all of the listed info for a long period of time, please don't create the page. We really need all of them but some have a higher 'priority' than others, meaning we can't allow a page to stay without that information for, let's say, a day. If an user constantly makes pages lacking necessary information and do not fill in those gaps for a long time, a mod can freely delete his thanks. If you have no means to obtain an item (as in merge shops or AC/member items) you can print a preview picture of that item so wiki members can then change it if needed. However, please note that we give priority to quality over quantity, not the contrary. It's better to leave one or two pages satisfactorily filled than 7-8 messy pages. rickyb20: On behalf of all the wikipedia moderators and helpers, I congratulate fellow moderator Tendou no Mazo, who just became an ArchKnight on the Battleon Forums! You can offer him some congratulations by posting in this thread. The official AQWorldsWiki is working for three years now. YES =D this means the wiki is now three years old and still a baby growing even more, THREE years >:D. I'd like to give a HUGE thanks to the official team (Angelique, Azami, Burn, Kitsukaru, Paperclip, Stardot, Vafrous Coyote and Versilaryan) for all their hard work and the new Mods (Omfgrly, Rickyb20, Tendou no Mazo and 1c3 R3b0rn) and known Admins (Ash, Burn, Hina, Mturf, Reens and Tflo) in getting this ready for all of new members and you, fellow player! /Cheer and /Salute us for another successfully year! BattleON! When you're about to edit something big, for example quest pages, NPC pages, item listing (swords, polearms) or other pages that require a lot of work, please, be prepared to make MOST of the page in one single edit. If you think you're going to need more then one edit (for the completed dialogue in quests for example) you really just need one or two more. Not fifteen. It not only overloads the page with edits, but it also makes history checking a pain for us, moderators. If you think you can't handle some templates (like collapsibles and tabs) and will make a lot of mess, please make sure you read the editing guidelines that can be found on the forums (link here, on the homepage) or simply ask for help on the wiki forums or PM a Mod. Remember, the Wiki is not a contest. We want editors to take their time and give their best while creating pages, as they're used by AQW player community as their main source of information. rickyb20: Just cleaned up the Inscription tag page. The new definition is below. If there is a message on an item in English, then that does not count as an inscription. The current translator page can be found here. If you have any new translators for other ones (along with AE proof), please feel free to PM me and I'll see what I can do about it. Thanks! Monsters: while fighting with a monster be sure to don't record crit hits or to use a skill which weakens the power of the target (as Necromancer's Weaken). Pages: there is much to talk about them, apply tags if possible and parent the page after editing. Just don't create a page without clearer info, if you can't own such item and info there are many wiki members which can get the work. Our wiki members will think the page is already done. Therefore while helping the wiki be sure you are appling our Image Submission Guidelines. Have a good one. rickyb20: Just wanted to remind everyone that rare tags are not to be put on any items on the New Releases page. DO NOT add rare tags to this page (even if the item went rare in 5 minutes). They do not belong here. rickyb20: If an item goes rare, please put it on the Recently Rare page and just leave it at that. I've seen a couple of people do it already with the LQS items that got released yesterday. Thanks. The wiki wishes to everyone a Merry Christmas and a Happy New Year! Happy Holidays! Hina: Format Update: pages that have a (2) in them (i.e. Fire Elemental (2)) and such are being merged into their original pages, separated by tabs. This is so we don't have a different page for everything that has the same name and artwork, but different stats. Not all are being merged, as there are exceptions, so please leave the merging to the mods. Jenchy: As Rickyb20 has stated prior to this, we will stop tagging items according to their year, now we will just tag them with their corresponding holiday event tag. As in all Frostval items will be tagged Frostval regardless their year of release, same goes for Harvest, Mogloween, Hero Hearts day and such. I took the liberty of switching all dated tags to single Mogloween tags. Thanks. rickyb20: I need everybody's help with the Mogloween Tags. If you see an item that's tagged with mogloween08, mogloween09, mogloween10 or mogloween11, please change it so that it says only mogloween. Thanks. rickyb20: Please be careful when copying Seasonal pages that have "Happy Mogloween etc." and "This is a blah Mogloween Seasonal Rare". Update those with the current year. Hina: Please stop creating "Macho Taco's Shop". The Taco shop page is Taco Day (Shop). rickyb20: Platinum Starsword doesn't exist in-game yet. Please don't make a page on it until it's released (not unless someone can give me proof that it is in-game (mod's character pages don't count!)) Thanks. rickyb20: There seems to be some confusion with how wiki pages on wars work. Here's how. When a war comes out, we make 2 pages for it: a war page and a location page (e.g. for BloodTusk War, we have a war page and a location page). The war page keeps information on the war, while the location page keeps information on the location. When the war is over, we add the rare tag to the war page. That's where the location page comes in. It tells us that the location from which the war took place is not rare (like the BloodTusk War). Please don't mistake the war page for the location page! We don't want people thinking that the war is still on-going when it's actually finished. Thank you. rickyb20: Guys, please don't force lock on ANYBODY. I already had to send somebody a warning about constantly forcing lock on someone who was trying to add information to a page. I'll be giving more warnings to anybody else who force locks me or anybody else adding info to the wiki. When doing Base Damages for weapons, please do it with a level 1 enhancement (of any kind) and with a class that does 100% damage (e.g. Warrior). If you're unable to do that, then please put "N/A (Needs Enhancement)" I'll be removing any base damages that are incorrect. PLEASE use the templates, and make sure you have all the correct information. I've been seeing a few people rushing the pages, making it look sloppy, or by doing it in multiple edits. Making a wiki page is not a race, so please do it correctly. Parent pages and adding tags. I've seen many pages either without one or the other, or both. If you don't know how to do those, feel free to PM me, or any of the other mods/helpers, or read the AQWWiki Editing Guide if you're new and don't know anything at all. Thanks everybody, and let's keep our wiki neat and organized! Hina: Updated the AQWWiki Editing Guide with a checklist of things to look for when creating/fixing pages, for your convenience. Hina: Please do NOT create Nulgath related pages. They're all Miltonius pages and just need to be renamed. mturf: Reminder: We prefer single weapon screenshots of daggers. All daggers are dual wield, and all daggers say "dagger" on them at least twice. The second weapon is considered unnecessary, such as helms on armors /etc. The easiest way to get it is using the airguitar emote. Ashendal: Please for all items (even Cyber Hunter) only use screenshots taken from in game, not taken from staff previews or original artwork. If we're slow at getting an image we can always poke. Hina: I'm pretty sure this has been mentioned before…but I'll mention it anyway. Base damage for weapons needs to be recorded at 100% damage, meaning you need to equip a class that attacks at 2.0 speed. Hina: For helpers, the list has been merged into the site members page, linked on the side bar under "Tools". Hina: I'm seeing rare tag adding as a problem, because people seem to be very trigger happy with rare tags and adding it to everything…on every page…on every link…. The purpose of the rare tag is to show that whatever the Rare tag is on is not available anymore in game. That's why there's one BIG rare tag up top. Hence, adding mini rare tags to everything inside the page is just redundancy. So if a page is rare, one big rare tag will suffice (you can make that happen by tagging the page "rare" using the tag function down at the bottom of any page, right beside the Edit button). Every other rare page has their own BIG rare tag, so there is absolutely NO need to add rare tags to every link on every page. The only exception is with items linked on monster pages or locations that have rare AND non rare monsters on it, things like that. Also, indexes are used for this purpose. They will contain all appropriate tags. Hina: We're looking for a bit of help around the wiki. If you're interested in being part of the wiki team, feel free to post here. Hina: Character pages now link to the wiki! :D When you click on an item on a character page it will link to the wiki in the form of a search. Basically it'll act as if you were searching for the item in the search box in the top right. Not as good as direct links to the actual page, but AE did it this way so they didn't have to do a spell check on item names…and you KNOW how bad they are with that ;) So yea, just an update on that ^^ cheers. mturf: I know this probably goes without saying, but here's a statement to make it official: Unlike other daggers, we DO want images of both daggers if they do not match each other (Such as Hollowsword and Shield). Hina: Updated the first post in the New Releases topic. Please read it before posting in it. mturf: Please read this post regarding adding and removing thanks. Please note that "Unknown" at this time is not a rarity. You can add the rarity field and "Unknown", but please do not add thanks. Ashendal: Since people are still making the same mistakes with images I'm going to make this here where everyone can see it. Armor images are supposed to be taken without Helms, Capes, Pets, and preferable using Unarmed. If you cannot use Unarmed pick the smallest weapon you can find or wait for someone else to put up the image. Un-equip everything possible except the armor, do not leave your helm on regardless of if it's your "look". Do not take the image upstairs in Yulgar's as it cuts off part of the very bottom of the armor, there are plenty of other places that they can be taken. If you don't know how to take an image properly look at some of the images done by Hina, mturf, or myself. I'm tired of images having to be replaced when they could have been done correctly the first time if the person takes the time to prepare instead of rushing to be first. Hina: When copying/pasting '09 pages to their '10 pages, make sure the info is correct, don't just copy and paste everything cuz many of them say '09 in their descriptions or have old "rare" tags in them that don't belong on the '10 pages. Please be careful with this. Hina: Just a quick little note for everyone. I've made an AQWWiki Editing Guide to help you out with working on the wiki. If you're unsure about how to do something, have a read through. If what you're looking for is not there, make a post, and I'll get on it! Hina: When creating a "rare" version of an existing item, like the Arcane Orb and Arcane Orb (Rare), make sure there's an actual difference, don't just clone the page and tags. Otherwise, the rare page would be pointless. If an item is no longer an AC item, like a bunch of Miltonius' items, make sure it doesn't have the AC or Rare tag on the new page. mturf: Please do not remove "Thanks" on pages yourself. PM mturf or Hina and we will look into the issue ourselves. mturf: Weapons DO have base damage stats. Please read this post. Nightly: In preparation for my birthday, I decided to let you all know that I'll be leaving for quite some time. In another announcement, I also plan on stepping down as a "Moderator" on the Wiki. Not that it matters since I didn't do all that much. Bye everyone. mturf: Stop editing images. Crop only. Even if you're trying to get rid of some text, don't. We have these rules for a reason and beside that, it looks terrible. If you can't do it with a crop, don't do it. Ashendal: Guys, stop removing old info please. If your going to edit something with new live info, USE THE STRIKE-THROUGH TAG. This is an encyclopedia, we try and keep all info. Look at the Beta Beserker prices to understand what I mean. Hina: Guys, when you're posting on the forum, make sure you're posting in the right forum and thread. Don't go posting every question and "fix request" onto the New Releases Thread. This thread is for the New Releases page ONLY. Everything else has their respective threads to be posted into. Hina: The PTR content is going live. DO NOT replace existing images. It does not matter what the color of monster names are. Only edit the info if necessary (i.e. HP/Damage of monsters, weapon base damage, etc.) Rarity has also been added to the templates, as well as room limit (max number of players in a room). If we see ANY unnecessary changes, we will be sending warnings and/or bans. Also, we will be changing up the format of image tags. Please check the forums regularly for updates on a few things like the wiki how-to, rules, etc. Ashendal: I will not repeat myself on this. If you rush to get pages up and do not properly take the image and are only doing it for the credit, don't post. Period. Rushing to be the first person to post something is not allowed and I will start issuing warnings for it. This is NOT a race, competition, or anything else along those lines. Do not let me catch it happening any longer. Hina: Also, note that PTR info is forbidden on the main wiki. That belongs ONLY on the PTR pages. Anything taken from the PTR will be removed, and poster WILL get a warning from now on (3 Warnings = ban). We can't stress this enough. Please DO NOT take anything from the PTR server whether it'd be for weapons, locations, monsters, or anything. It does not belong on the main wiki. (And if you look below, you can tell TLH is pretty upset with his blood red text, so if you want to avoid trouble, I suggest you don't do it). Ashendal: Do not take any dagger images on the PTR servers. Only use the live servers for dagger images at this time. Also do not take any images from character pages unless they show the ENTIRE weapon. Missing pieces of a weapon don't make for a useful image. Hina: Reminder to all AQWWiki members, please read the rules and guidelines on the wiki forums to avoid any unnecessary mistakes or rule breaking. Either of those can result in a reminder, warning or ban, depending on the circumstances. =AQW= March 11, 2010 Design Notes - Wiki Wiki Wiki! It's a Wiki Birthday! Also, as rule 10 states, BE ACCURATE (and use templates which are at the bottom of this page). Triple check your edits before clicking the Save button. Use the Preview button often and whenever possible to check your page before submitting the edit. I don't want to see separate edits for adding changes to a page and adding your name. I also don't want to see multiple edits trying to get the code to work properly. There are templates to use, and other pages to follow if you don't know how to do something. You can also view the Page Source under "Options" to check the code of an existing page, and copy/paste any code that you think you need if you don't already know how to do it. 2. Forcibly remove someone's lock if they are editing a page. This is rude and unneeded and will result in a warning/ban. 3. Creating pages just to get your name on the page. There's no point in creating a page and/or leaving a template there with little to no information. This includes just posting pictures, or just the template, etc. If you have little information to give, let someone else create the page. If I see this happening I will delete the page, and if need be, I will create the page myself and lock it, so any info that needs adding will need to go through an admin/mod (check site members link on the sidebar to see a list of admins/mods/members on this site). So if you're one of these people, change your habit, because you can be sure your info/name will not be on the page you contributed to if you don't. 4. Adding your name separate from your edits. If you really wanted to add your name, you would have done so in the same edit. If you "forgot" to add your name, that means you don't care enough to add your name as you edit a page. Adding your name alone is not considered an edit that contributes to the page, and your name will be removed. If you re-add your name to the page after it's removal, a warning will be sent. If the problem continues, you will be banned. 5. Do not delete old images of graphics that are no longer in game. If something has had a graphic update so it looks totally different, create tabs and keep both images. Do not delete the old image and add the new one. This is a collection of as much information as we can get, deleting old things doesn't work towards that end. 6. Don't edit any images you're adding. Cropping them to only show the item in question is the only alteration allowed. Using paint to do that is fine, but don't alter them in any way beyond that. Adding websites to the corner, altering the colors, or removing the background itself isn't allowed. Any questions or comments can go on our forums, which is linked to on the sidebar and top menu.